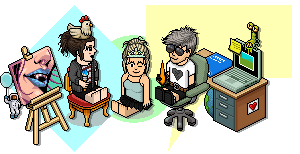 We are looking for dedicated and creative people to join the Habbox Competition Department! ► Ability to come up with exciting competitions for Twitter, the forum and themed events. ► Good writing skill is desired but not essential as all competitions are peer reviewed. ► Write at least 3 competitions per month. ► Maximise interest and promote Habbox through competitions on Habbox, Habbo and social media, such as Twitter. Why do you want to join the competitions department? Last edited by Ozad; 04-02-2019 at 11:34 PM.